(Newser) – "Nothing to see here," was US military officials' reaction to an incident this week involving Russia off the coast of Alaska—even though the Air Force sent two F-22 fighter jets and an early-warning plane to address the situation. A spokeswoman for the North American Aerospace Defense Command tells the New York Times that two Russian Tu-95 Bear bombers zipped within 100 miles of Kodiak Island Monday evening, within a few hundred miles of the airspace around the US and Canada known as the Air Defense Identification Zone. 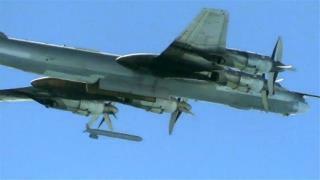 Fox News first reported on the incident after US officials confirmed that the bombers, which are said to be capable of carrying nuclear weapons, flew about 280 miles southwest of Elmendorf Air Force Base, causing the US to scramble the F-22s and an E-3 early-warning plane to intercept them. This has happened hundreds of times on both coasts. In and of itself, it's insignificant. Taken in a larger context of a resurgent Russia, depending on specifics, it may be more than just one more surveillance missions by Russian military. We will likely never know which it is. I flew to Denver and was a few hundred miles from Los Angeles. I was on the USS Saratoga CVA 60. 1968-1972 in the med. The Bears use to call us to tell us they were coming and where. We would send up two escorts. They would fly around take pictures of each other. Ask about the wife and kids have a little reunion break off. They would head home and our planes would return to the ship. Just a dog and pony show. The Russians were just as bored as we were.